Thyroid antibody lab tests are tests often overlooked by physicians when checking for thyroid disease. This is unfortunate because when caught early, the amount and length of time the thyroid is being attacked could be decreased. If you are interested in learning more about thyroid health, click here for my last post. Hang with me here and we will talk about why thyroid antibody tests are important and if you should have yours checked. An antibody is a protein made by plasma cells in response to an antigen, or a substance the body thinks is a “bad guy”. Each antibody can bind to only 1 antigen in order for the immune system to attack and destroy that antigen. So, obviously, thyroid antibodies set up an attack on the thyroid gland, each one in a different way. Anti-thyroperoxidase (TPO) antibodies are the most common and are associated with Hashimoto’s Thyroiditis along with anti-thyroglobulin (Anti-Tg) antibodies. Thyroid Stimulating Hormone (TSH) Receptor (TSHR-Ab) antibodies are associated with Graves’ Disease. Did you know that thyroid antibodies can be present before other thyroid hormones are out of “normal” range? So, if I ask you if you’ve had your thyroid labs check and you are like, “yep, my doctor says my thyroid is good”, it is usually only a TSH level that is checked. This lab test can only give us a small picture of what is going on with the thyroid or maybe not tell us anything at all. Antibodies can be present for years before we see a change in the TSH level. This is super frustrating because if antibodies are present, they can slowly destroy the thyroid over time. This will eventually cause the thyroid to not be able to produce hormone efficiently, then causing the change in TSH. Thyroid antibodies can produce symptoms even when there is no hypothyroidism detected. Symptoms can include fatigue, anxiety, depression, weight gain, general poor feeling and potential for miscarriage. So no, you are not crazy when you tell your doctor you think there is something else going on even though your labs don’t show it. Thyroid antibodies with a normal TSH can be an early warning sign of Hashimoto’s Thyroiditis, an autoimmune disease. It is estimated that 90% or more of those with hypothyroidism have Hashimoto’s disease. But, not all of those with Hashimoto’s will have elevated antibodies and will need a thyroid ultrasound if symptoms persist. I am one of the few with hypothyroidism and not Hashimoto’s. If there are antibodies present and an elevated TSH, Hashimoto’s is likely in the later stages. Why are doctors not testing antibodies? After reading the information above, you may be asking this same question. Right? Many general medicine practitioners don’t think that an autoimmune disease can be treated and reversed. Therefore, there is no need to know if antibodies are present because it doesn’t change their treatment plan. The root cause doesn’t really matter. They will treat the thyroid if the labs show that it makes sense. Or, if they are aware of autoimmunity, they want to suppress the immune system causing more problems and side effects. If I have antibodies will I always have antibodies? There is no cure for autoimmune disease. Once autoimmunity is present, there is always a potential for your immune system to attack your own cells causing problems. There is, however, a way to support the immune system, reverse or decrease autoimmunity and prevent further attack on the body. Nutrition and lifestyle play a large role in supporting the immune system and this topic deserves multiple blog posts! And, just so you know, I care about the root cause and it does matter! Antibody levels will change in response to underlying causes, like stress, food sensitivities and infections. It is important to also look at the big picture of how you are feeling. If you have antibodies, it is great to have them checked occasionally with your other labs because it can tell you if your interventions are working or if you are maybe having a flare up and need to try something different. 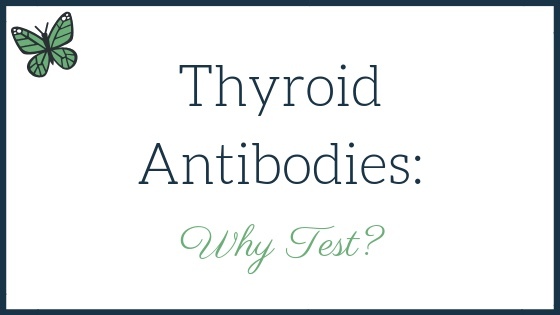 Who should have thyroid antibodies tested? You have another autoimmune disease like celiac disease, multiple sclerosis, Sjogren’s, etc. Once you have an autoimmune disease, you are 3x more likely to develop another one. You have classic symptoms of a thyroid issue but your TSH continues to come back in the “normal” range. You have a close family member with an autoimmune disease, especially Hashimoto’s or Graves’ disease. You’ve been diagnosed with hypothyroidism or hyperthyroidism but have not had antibody tests done. Antibodies can be an important piece of information when we are looking at thyroid health and thyroid diseases. They do matter and they can be decreased with immune system support. Antibodies can be present long before the thyroid is showing signs of attack and decreased function. As always, be aware of symptoms and be diligent in finding a doctor who will listen to you.